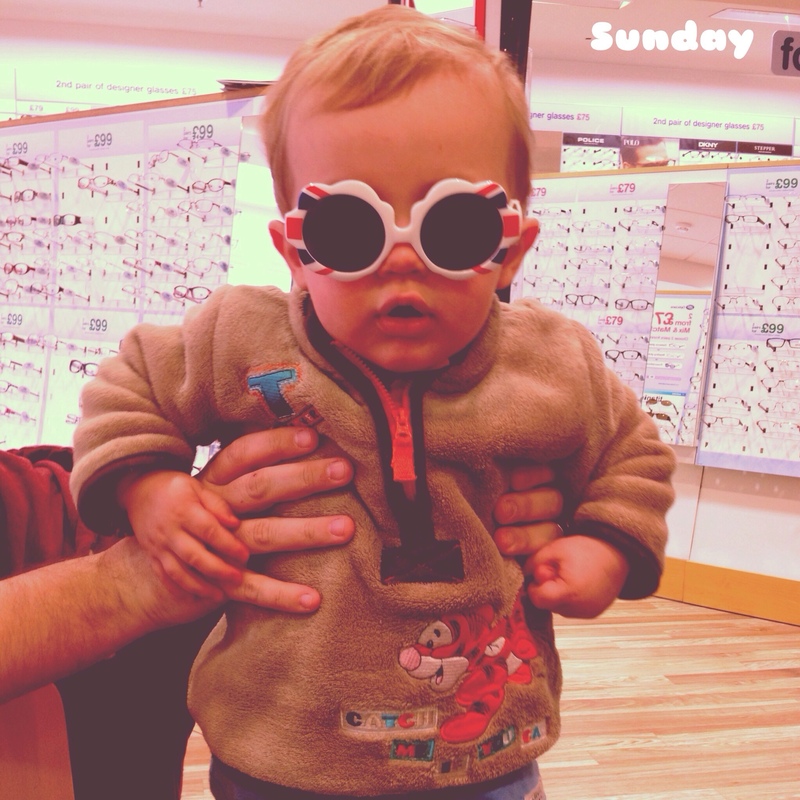 On Sunday, we went shopping as I need some new glasses. Thomas did not want to miss out on the fun so tried on a pair too! 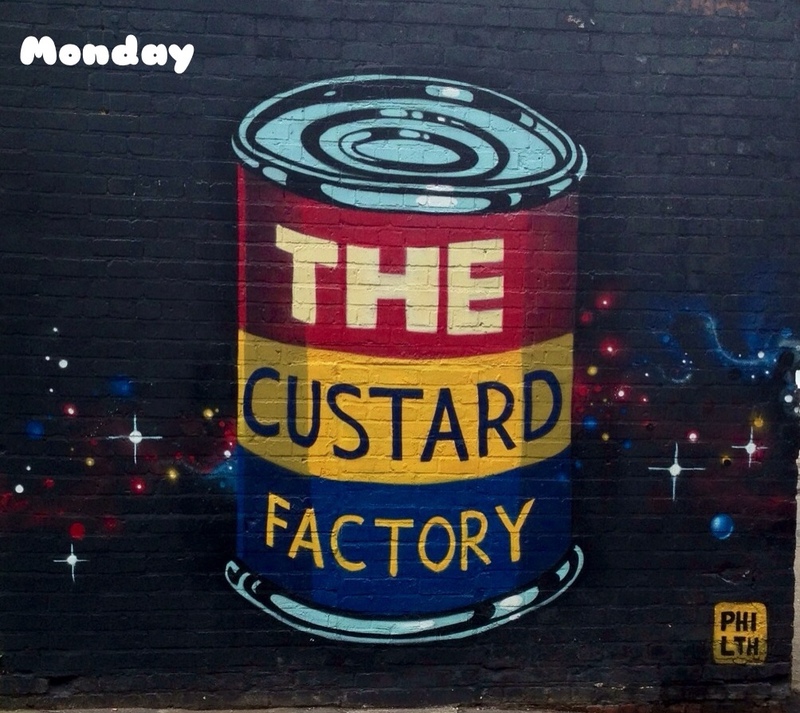 On Monday, Thomas and I went to lunch at The Custard Factory in Birmingham to meet with a fellow food blogger. To find out what we discussed, find the hashtag #futurefoodies on Twitter. 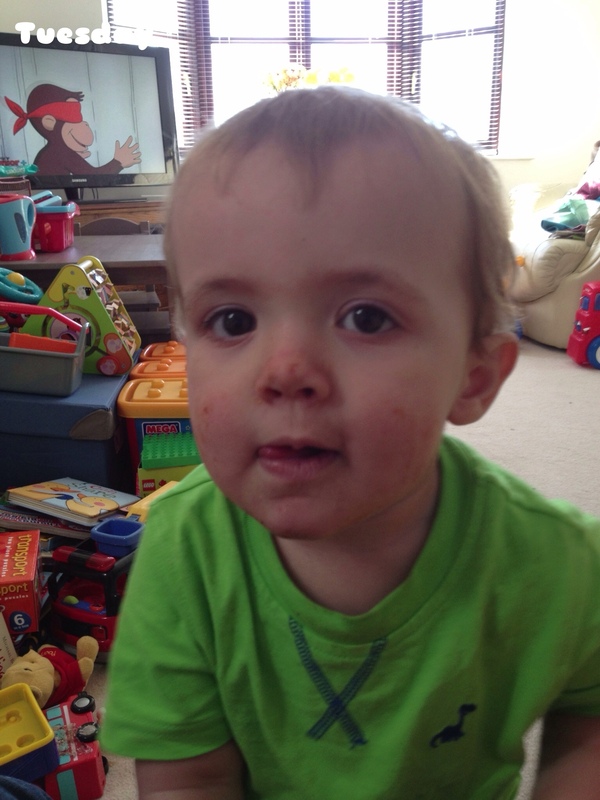 On Tuesday, Thomas came home from nursery looking like he had been swimming in a bowl of baked beans!! 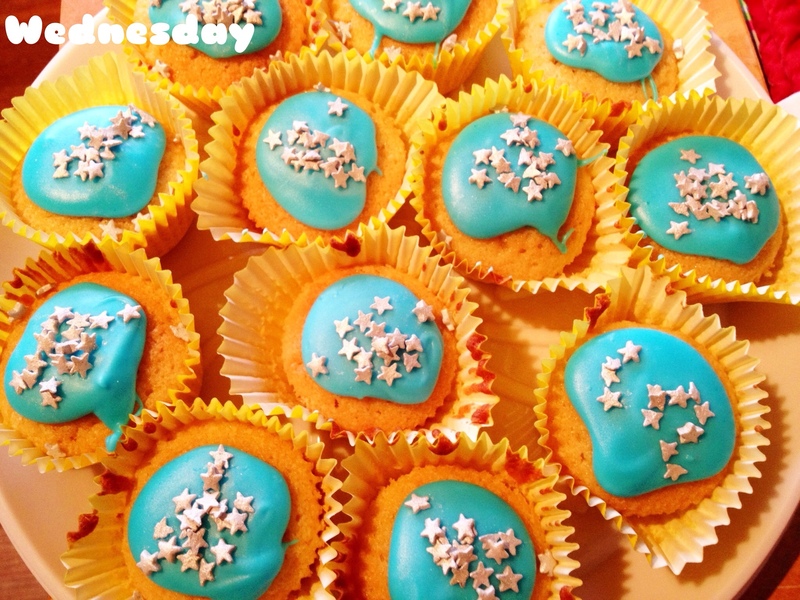 On Wednesday, I took some star fairy cakes to my local NCT Annual Members Meeting. I was very delighted to discover that the branch have nominated me for a national NCT award for my volunteer work. 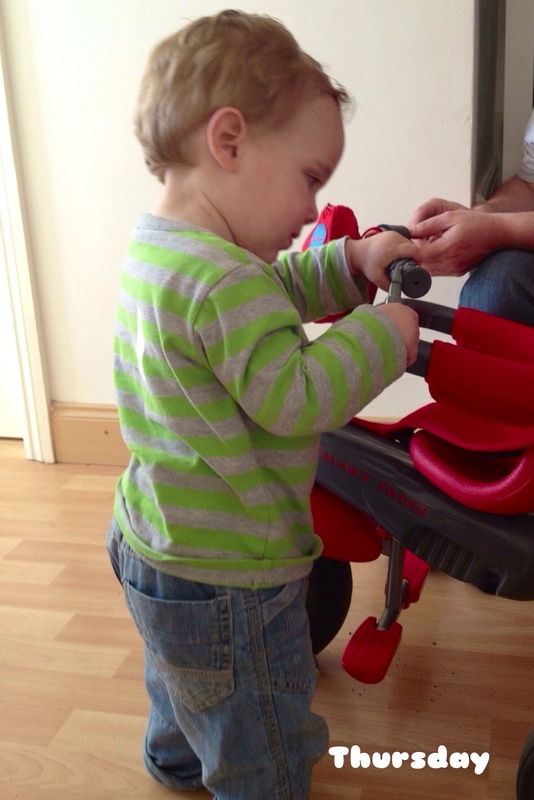 On Thursday, Thomas helped Daddy and Grandad fix his trike. We are waiting a replacement wheel but have managed to temporary fix our broken wheel so Thomas can still enjoy the sunshine on his trike. 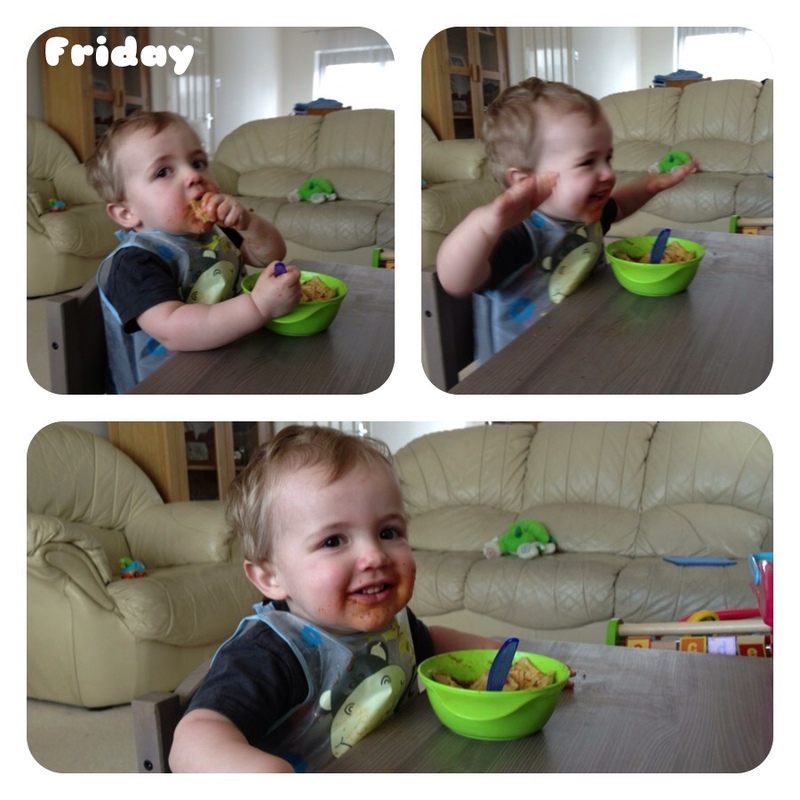 On Friday, I was feeling brave so let Thomas eat his favourite pasta and bolognaise on his little table and chairs. He quite enjoyed it as you can tell from the pictures. 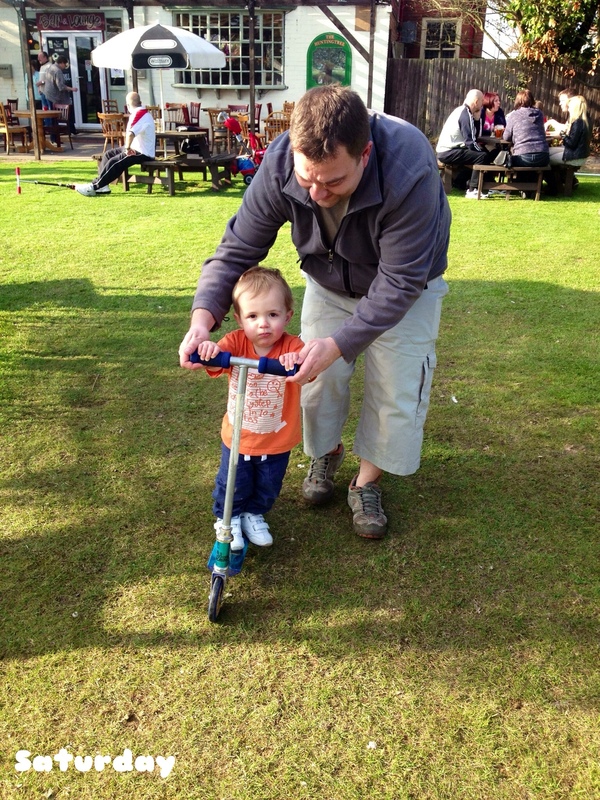 Today, we have enjoyed the sunshine and Thomas has been on a big boy scooter. 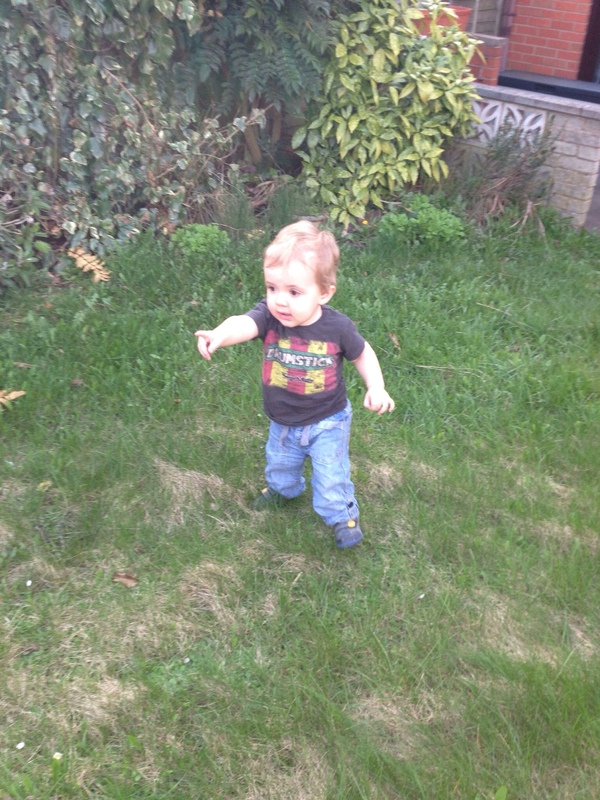 Thomas is 18 months old next week and this is the first real taste of spring he has had. 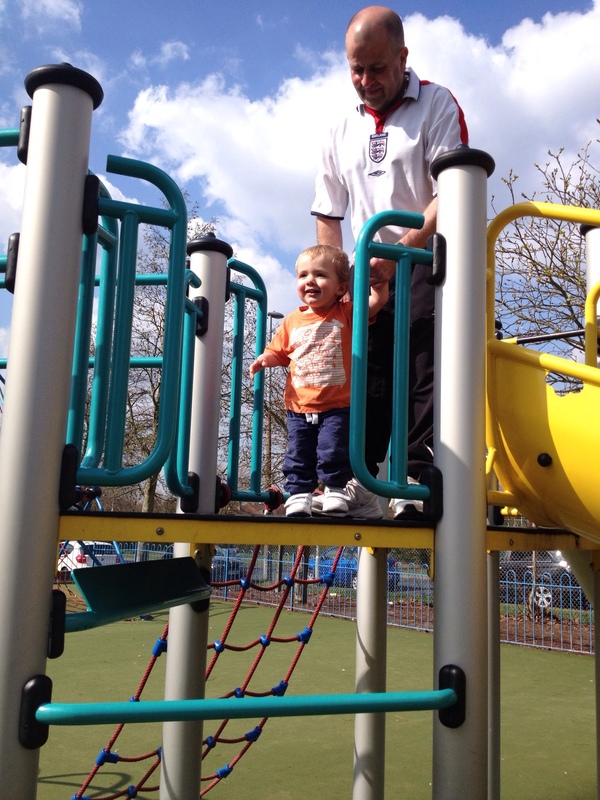 Today we have taken full advantage of the weather and have had fun doing lots of new things. 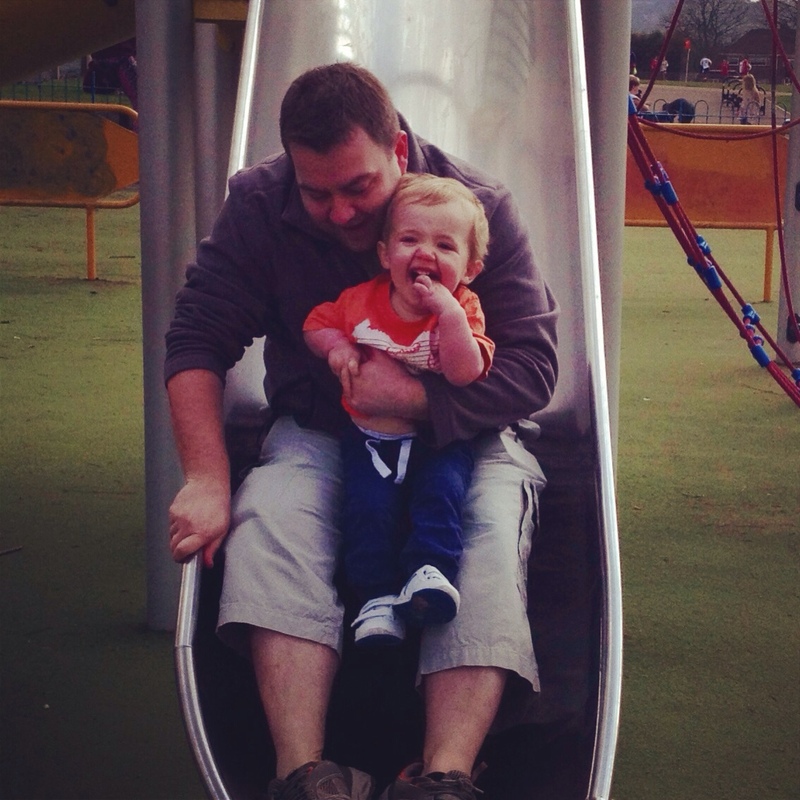 We have climbed on ropes, been on the big slide in the park, been on a big boy scooter and written with a stick in the dirt. Thomas enjoyed every second of it. He really wants to be a big kid and tries to copy everything they do. I cannot wait for the other first adventures we are going to have this summer!! 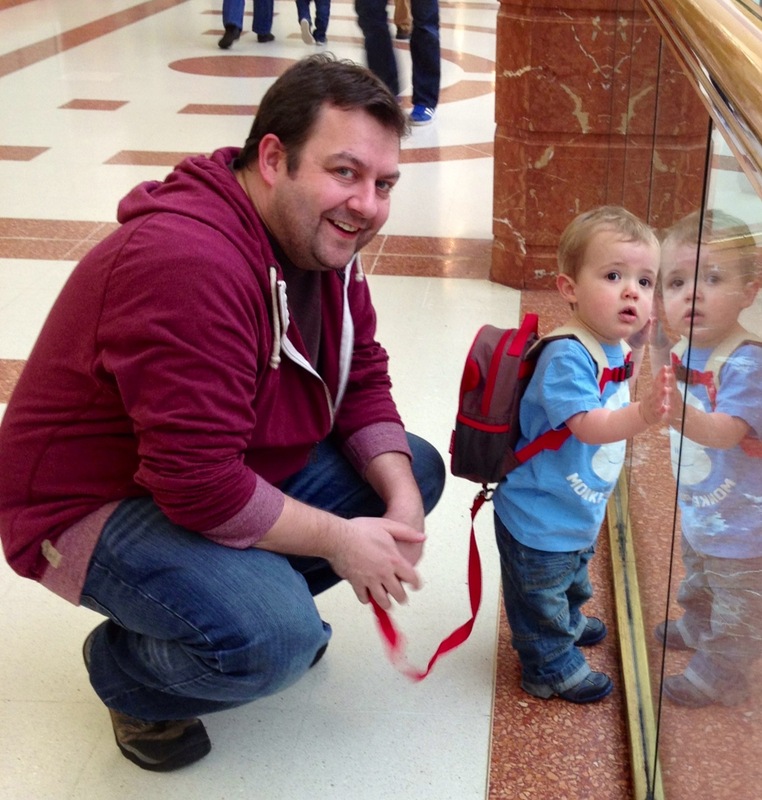 On Sunday, we needed to get Thomas some new shoes so we went to Merry Hill. After getting the shoes, we went to Pizza Hut for lunch. 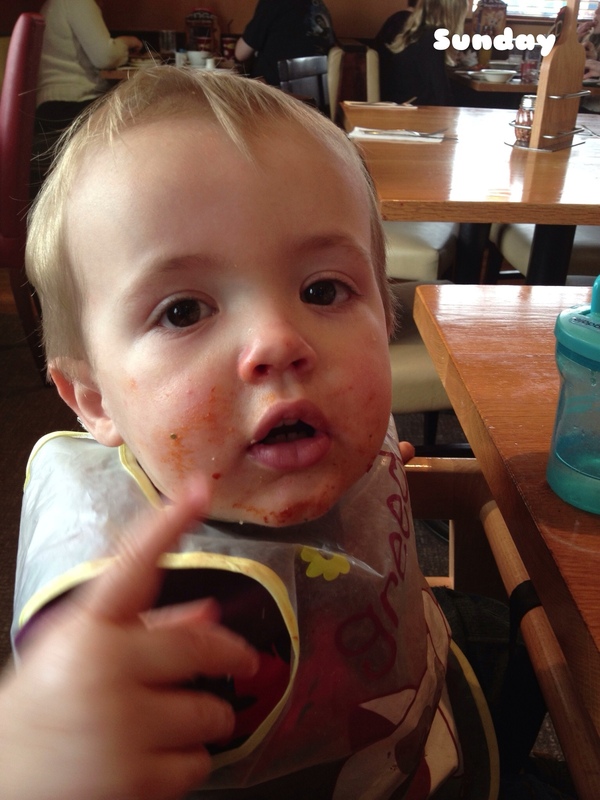 Here is Thomas' post pizza face! 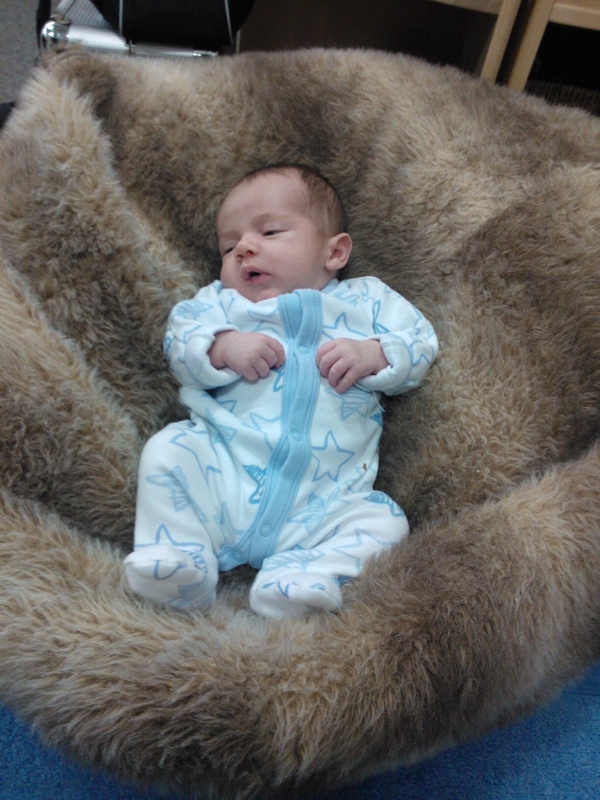 On Monday, we went to our baby signing group then came home and had a quiet afternoon. 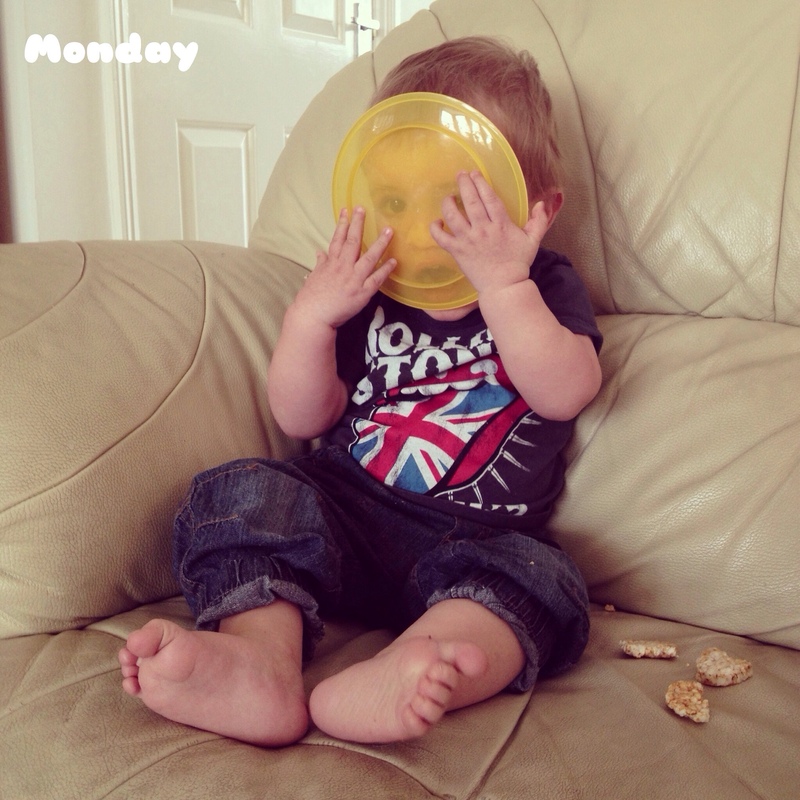 Thomas decided that plates were not for food but were face masks instead! 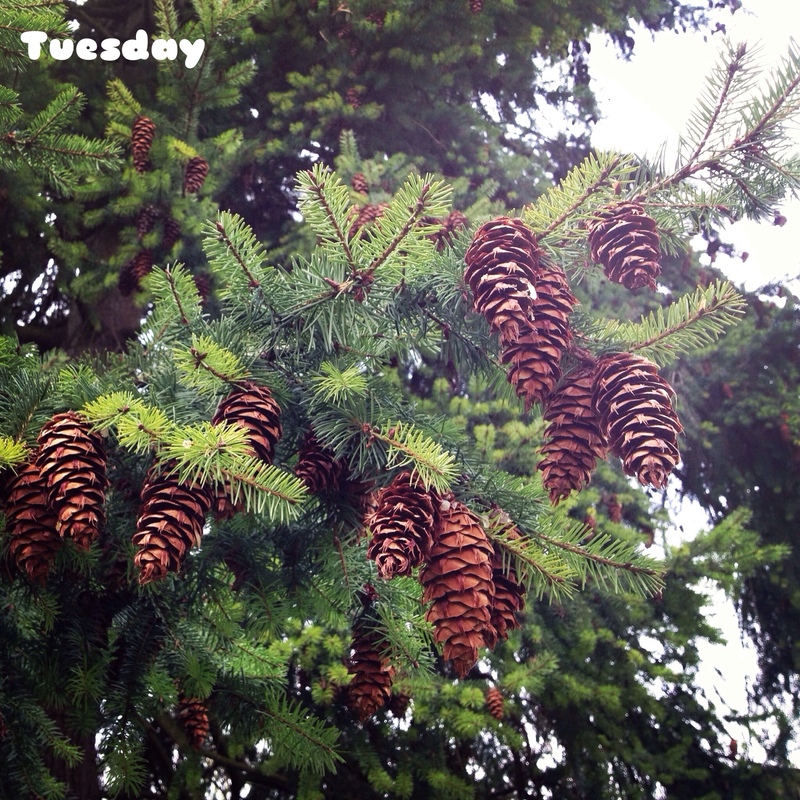 On Tuesday, I went for a walk outside my work testing equipment and saw these pinecones hanging in a tree. 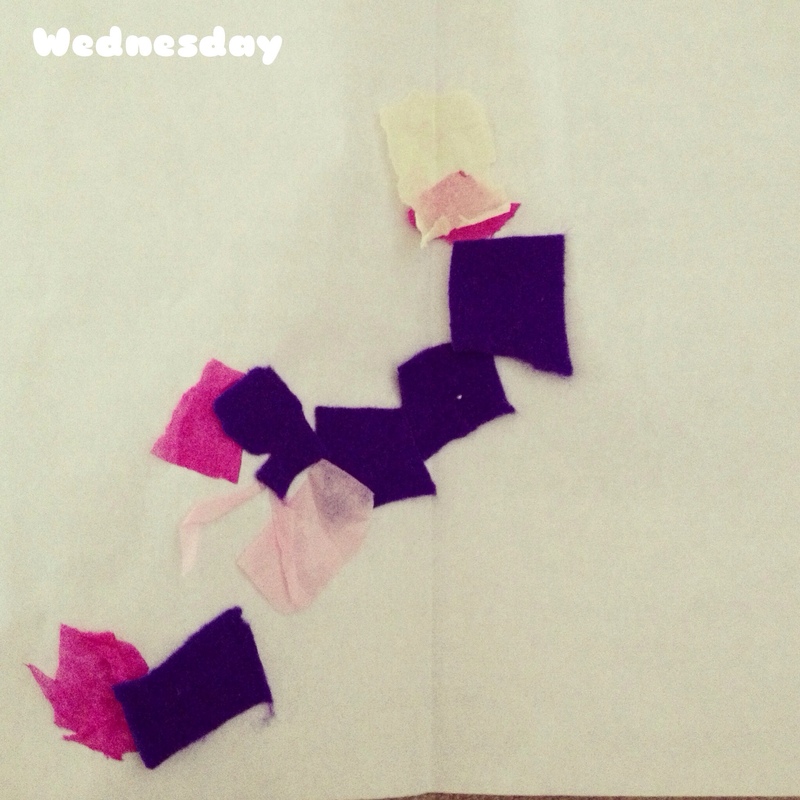 On Wednesday, Thomas brought some sticking art back from nursery. On Thursday, Thomas played with the new play tunnel I got him for a bargain £8 from Asda. 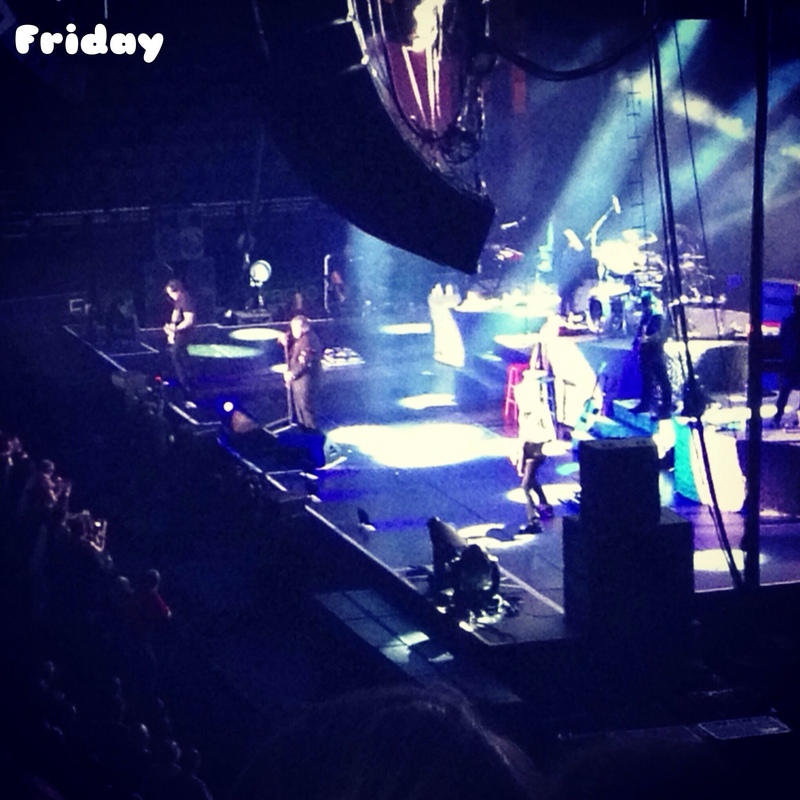 On Friday night, I went to see Meatloaf at the LG Arena at the NEC. It was fantastic. Such an amazing, emotional show. Yesterday, we went to Brum Yum Yum, a new streetfood event that will be taking place in Kings Heath, Birmingham every month from now on. 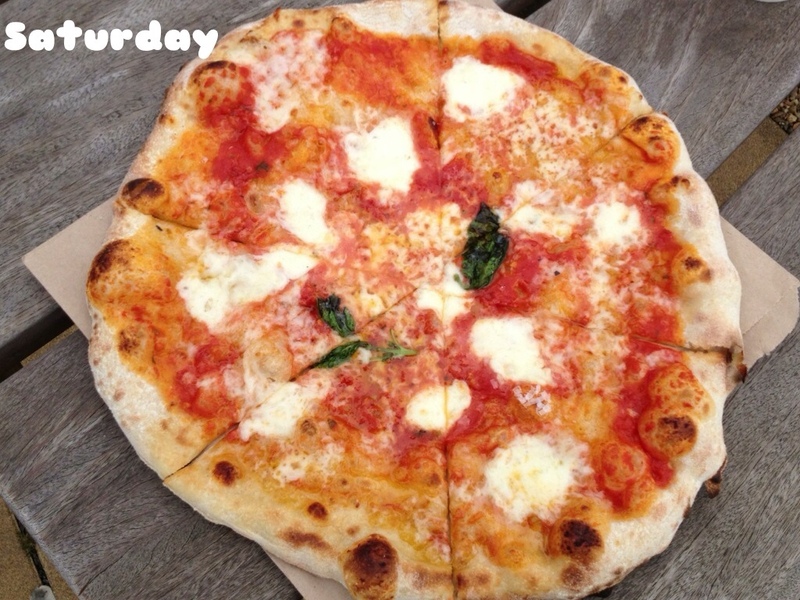 We ate the most gorgeous pizza while we were there. 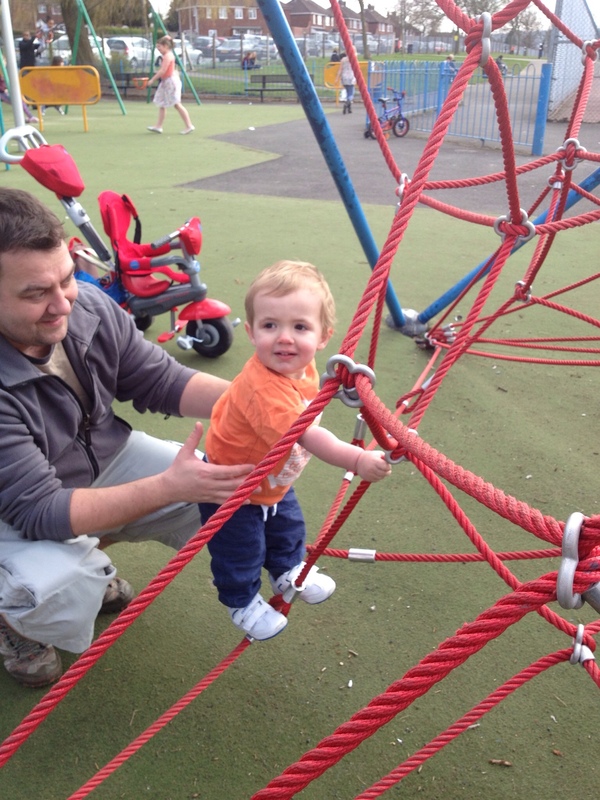 Thomas’ birth at the end of October 2011 was the beginning of a crazy year for us. We had a baby, moved house and got married. Three of the most stressful things you can do in your life all in one year! To top things off, for most of the year I was living on maternity pay. Fortunately, where I work gives paid maternity leave for nine months instead of the usual six. 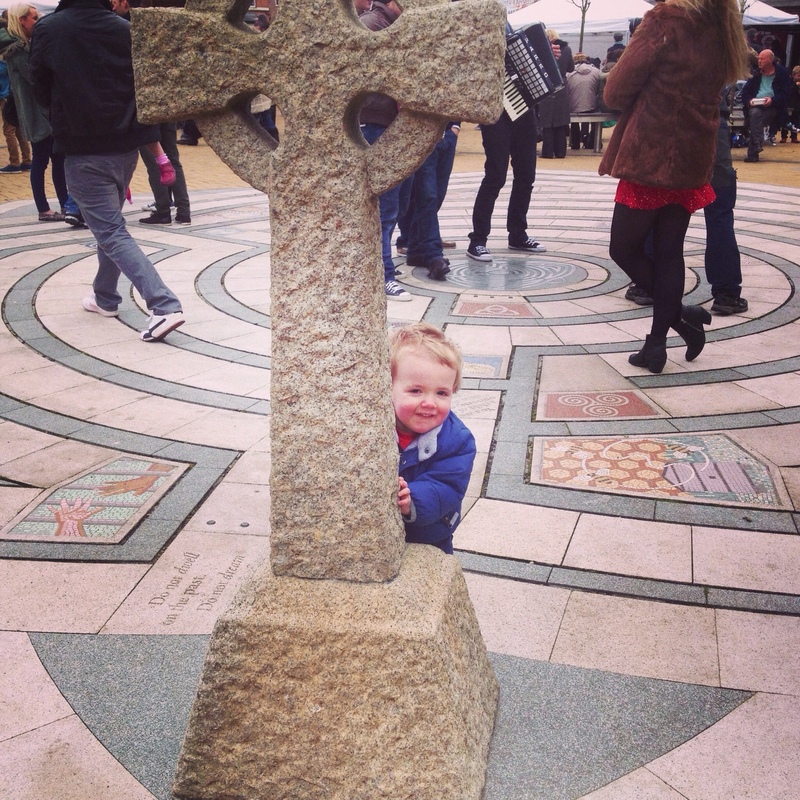 However, as I went on maternity leave earlier than expected due to a pregnancy related complication, the money ran out sooner than I thought and it was two months with no money before my holiday pay started. Unfortunately, the exact time I ran out of money was a month before our wedding in August. Normally we could have survived this and lived on one salary for a while, but with a baby, a wedding, and two mortgages to pay for (our previous house was not sold until after the wedding) times were very tough indeed. It was important for us to find the best credit card to help pay for one off wedding expenses and ensure that we could get everything Thomas needed. 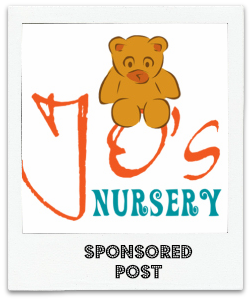 According to Which, babies cost £1200 in the first year and this is just on baby essentials including nappies, wipes, formula milk and food. 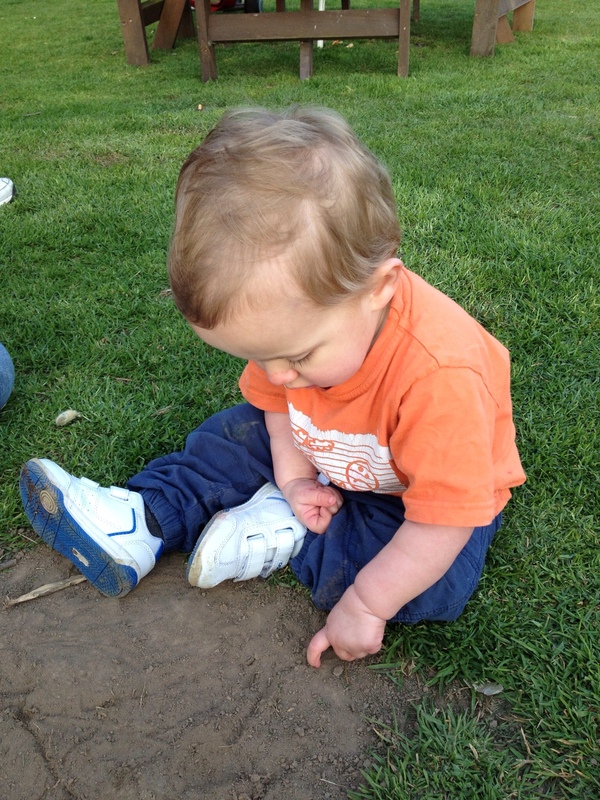 At the time our money nearly ran out, Thomas was 9 – 10 months old and was starting to get much more active with crawling and attempting to try to walk. Stair gates had to be purchased and the entire house had to be baby proofed. Being first time parents, we did not know where the best places to go for some of these items were so we probably ended up spending more money than we could of done. 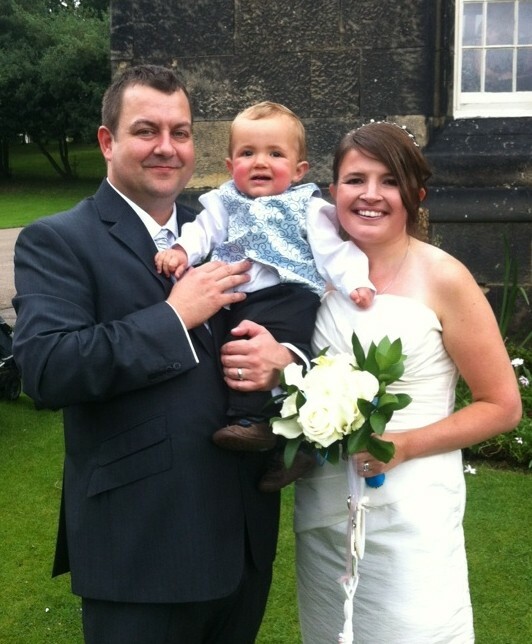 Fortunately, we survived all this and made it to our wedding day in one piece and our finances were just about intact. We had a fantastic time at our wedding. It was a lovely party and everyone seemed to enjoy themselves. Not long after we got back from our honeymoon (in Bognor Regis), we found out that our old house had been sold and we would have money again soon. I also went back to work part time which has improved our finances a little too. Our credit cards are still there in case we need them but I am really hoping we do not have another crazy year like this again!